I found this great post by Arik C. Hanson, for his blog Communications Conversations which he posted back in September and I wanted to share it with AJGpr blog readers. 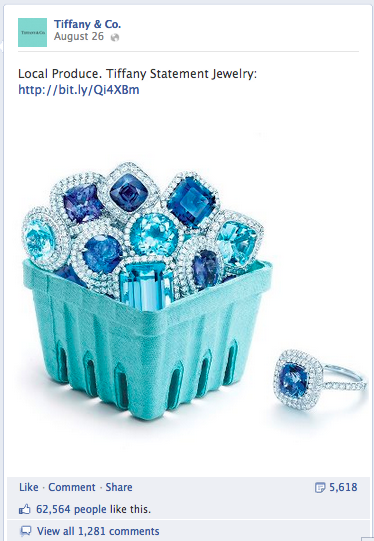 Last week, I talked about the obvious trend of “art direction” when it comes to content on Facebook. However, what’s relatively shocking is the few number of brands that have caught on to this huge content shift on the biggest social platform. I mean, by and large, many of the larger, Fortune 500 brands are on board. Mostly because they have huge agencies assisting or guiding them (not all the credit goes to the agencies, but it surely mitigates the risk that you’d miss a trend like this when you employe a huge, international agency to keep you AHEAD of trends like this). Look just below those larger companies though, and you’ll find an overwhelming amount of companies that are still playing by the 2010 Facebook rules–share links, ask questions, use polls. Those rules are virtually dead, my friends. 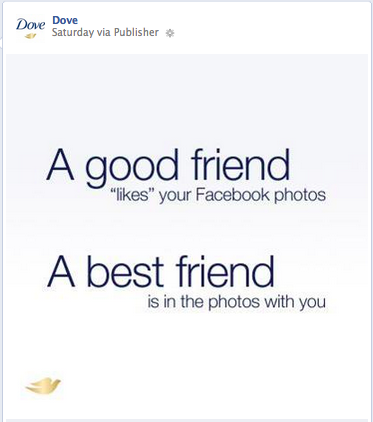 Welcome to the visual era of Facebook (and, oh by the way, I really should have welcomed you about 4-5 months ago). 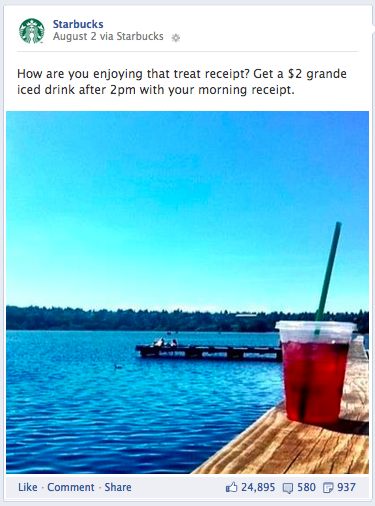 I know this has been well documented by now, but you know what I love most about what Starbucks does on Facebook? It’s the ad-hoc shots they share. These are shots that are not taken by a full-blow production team, but instead (most likely–my guess) by one of their PR or social media folks “on the fly.” It’s the way of the new world. 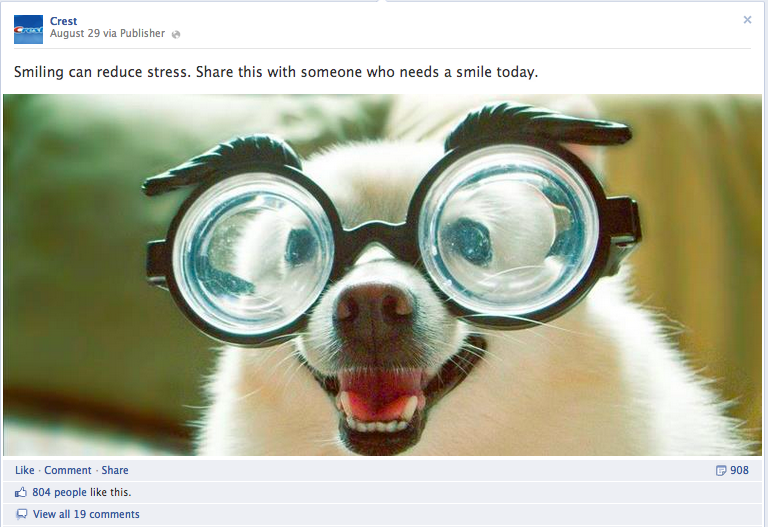 Brands that are nimble enough to pull these sorts of visuals off quickly are going to succeed in the new Facebook world. Look what Tiffany’s is doing here. Simply using pieces of ads as the visual and pairing it with an “ad-like” headline is enough to earn a few likes/comments. As much as everyone wants to be Oreo right now (don’t lie, you do), good, old-fashioned branded photography still works in terms of engagement. Remember, most of your fans on Facebook are there because they are EXISTING customers. They’re just looking for reasons to like your posts. Sometimes you just don’t need to overthink it. 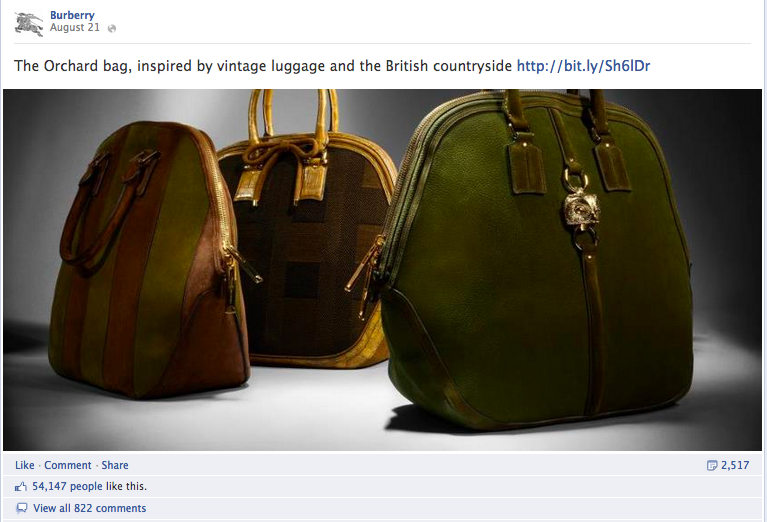 Give them branded photography–like what Burberry does here. 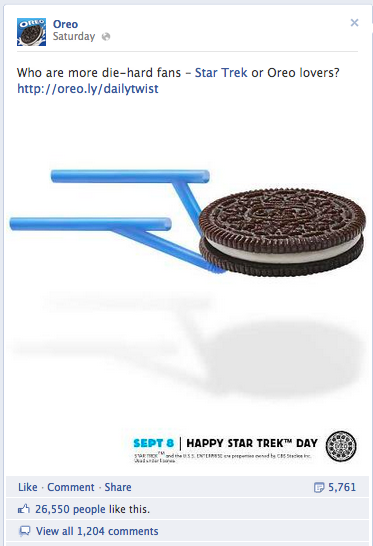 Oreo solved the problem so many brands have: How do we “celebrate” all these odd dates we want to recognize on Facebook, but do it in a way that inspires engagement? As we all know by now, Oreo has done it brilliantly by using their product in a creative way. I’m not say you need to go follow Oreo’s lead, but how can you use your creative flair to do the same? Visually. You know those quotes you use all the time on Facebook via text? Here’s the thing–they work MUCH better as visuals. Just see what Dove has done here. You’re seeing more brands taking this approach–because it WORKS. You know those run-of-the-mill text posts that worked so well 4-5 months ago? Fill in the blank posts, for example? Well, why not make those visual, too? 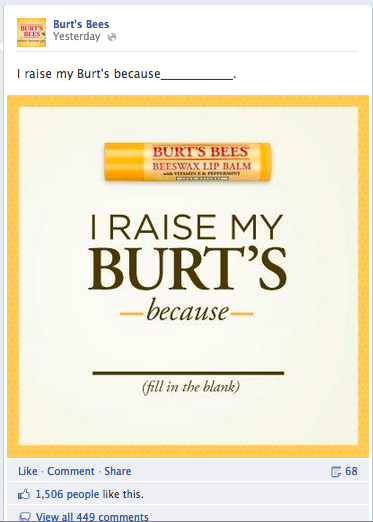 Just look what Burt’s Bees has done here. Perfect. Gulf Coast Crestview High School senior, Ben White contacted me over the weekend about helping him promote the Crestview High School Lip Dub he directed. It’s not common for a high school student from Florida to contact a LA based PR firm to create a campaign for a student made YouTube video. But I was impressed with his initiative and took a look at this YouTube sensation. Ben shot the Lip Dub video in one take utilizing 700 members of their 1900 +/- student body (the schools clubs, teams, and organizations were all represented). Ben’s creative efforts went viral immediately racking up over 20,000 views the first day. To date it has over 83 thousand viewers and has received local broadcast press. Lip Dub’s are a YouTube trend, where students (high school or college) show their school spirit in the form of a music video that combines lip-synching and post audio dubbing. The idea for producing the Lip Dub at Crestview High was first conceived by Ben in a Leadership class as a way to inspire, excite, and motivate the students at their feeder schools. The student body came together to lip dub Firework by Katy Perry and Check It Out by Will.I.Am/Nicki Minaj. Crestview’s award winning band, marine biology students in wetsuits, culinary arts members with chef coats and flour speckled faces, school athletes (tennis rackets were swung, and basketballs, footballs, baseballs, softballs and volleyballs were tossed, cross-country runners are stretching, and wrestlers flexing their muscles); a red caped banana guy and a green man, the Crestview Bulldog mascot, and a reenactment of the “Thinker” statue, a blonde in a red tutu and a Supergirl with a red cape, thespians and artists, dancers and cheerleaders; welders with masks; fishermen, rock gods, computer geeks, mimes, and regimented ROTC students, are all part of the production. Suffice it to say that Ben White is now a client and I believe his and the students of Crestview High’s efforts are worth a watch. Share it to your friends and family. Keeping up with PR trends and public relations news — what’s new, what’s hot, what’s not – is par for the course for PR specialists. So what’s the most efficient way to enhance your PR knowledge and keep on top of best practices? Read – and blogs today are fast becoming your top source of information. So how do you sort through the hundreds of PR blogs out there? AJGpr has simplified the search and recommends these 10 blogs that offer high quality content. Check them out.